You’re publishing videos on Facebook – hooray! Video is currently all the rage, and Facebook Live as well as direct-uploaded video files are favorites in the Facebook algorithm. What I’m about to write may seem counterintuitive given the popularity of live video…but…there are a lot of people who will see (and watch) your video without sound. If you give it some thought, it’s actually not that weird. Video is favored in the News Feed, so it has a higher likelihood to show up in your feed. Think about all the times, as you move through your day, that you check Facebook. There are probably a good number of those times that you’re glad the sound is off because video playing over your phone or at your computer at work would not be ideal. 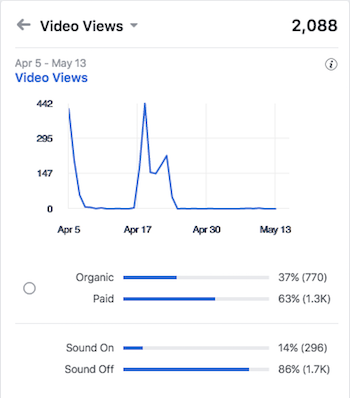 If you’re curious to find out what percentage of the videos views you earn have the sound on or off when viewed, there’s a way to look. Visit any of your video posts and click on the number of people reached that shows up beneath the video. From there click on Video Views, and then scroll down a bit to the Sound On/Sound Off section. 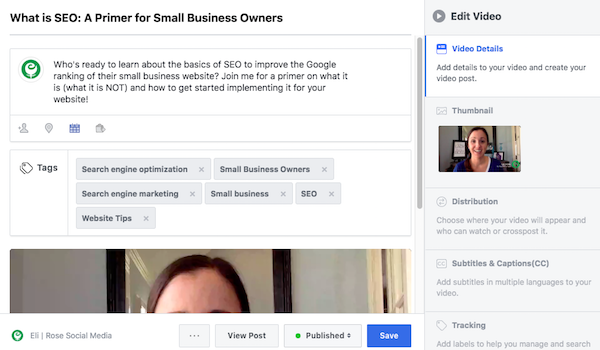 So if you’re making and posting videos to your Facebook Page, which is fantastic, you can take full advantage of those videos and all the views you get by adding captions to your videos. 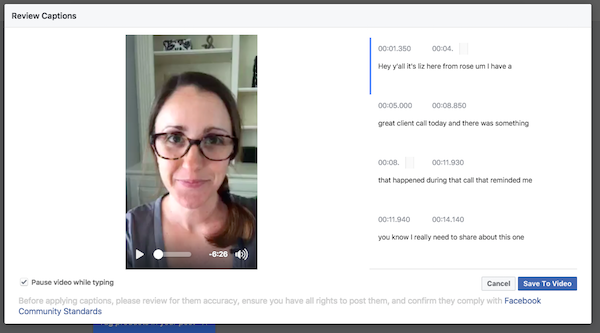 The process of adding captions to your Facebook videos is a bit different if/when you run an ad in the way that if you create a new video for the purposes of an ad, you can have Facebook generate captions for that video once you upload it to your Ads Manager (meaning, a video doesn’t have to be published on your Page first to add captions). 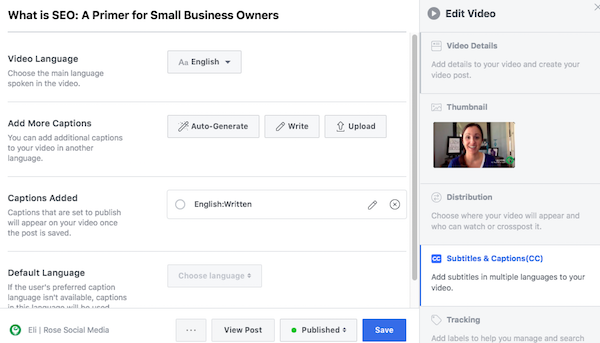 But for the most part, these instructions that I’ve included below will be the ones you’ll use to add captions to your Facebook videos, regardless of whether you post that video on your Page or upload it to your Ads Manager for an ad. Facebook captions are free to add. You can have Facebook generate captions for a video you directly uploaded to your Page or for any Facebook Lives that you do. The videos do need to finish processing (either after uploading or once you finish your Lives) before the captions functionality becomes available. Visit your Page, click on Publishing Tools located in the white Admin navigation bar (or by typing in https://www.facebook.com/YourPageName/publishing_tools/), and then click on Video Library in the left sidebar. Hover your mouse to the right of the title of the video you want to add or edit captions for. Click on the pencil icon that says “Edit Video”. Alternately, you can find the video post on your Facebook Page and click the icon with the 3 dots in the upper right corner. You’ll be presented with a drop-down menu that, depending on how you are viewing your post, will either say “Edit Post” or “Edit Video”. Click on the Subtitles & Captions tab to either upload an .srt file of captions you’ve already prepared, click to have Facebook generate captions for you, or write your own. You’ll also need to choose the video language for your captions. Once Facebook has finished generating captions for your video, it will give you the option to review and edit them. Expect that there will be a fair amount of editing to do. You can start and stop the video manually, and Facebook will stop the video for you when you start to type in one of the caption fields. Once you have edited your video captions to your liking, click the blue Save to Video button and you’re all set! 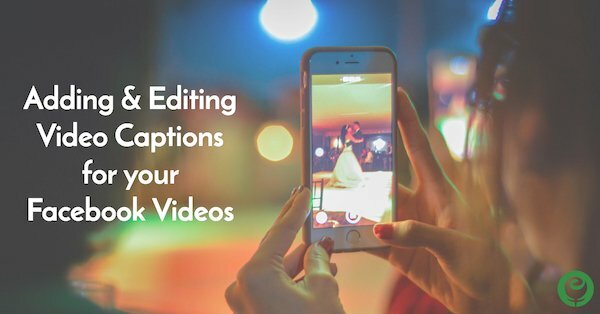 As soon as you’ve clicked on Save to Video, your video will now play for viewers with captions included. If you find a mistake in your captions that you need to fix, follow these steps to make that correction and resave them to your video. If you also publish your videos on YouTube, you might find it easier to have YouTube generate captions, edit those, and then download the .srt file from YouTube, to upload to your Facebook video. What I’ve found is that YouTube captions are much more correct than Facebook captions, so less editing for you. Also, if you caption your Facebook video to later upload to YouTube, those captions don’t carry over. Hey James! Are you clicking to “Save to Video” and then refreshing your page after doing so? Thanks! Thanks for the article. I uploaded my first video a few hours ago, but I don’t see the option to generate the captions? How long after uploading does it generally take to show up? I’ve gone back to the “edit” selection several times, but only see the “upload SRT File” option. 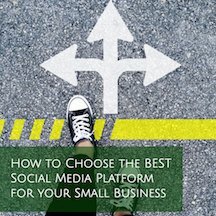 Is the auto generate captions choice available to everyone with a Facebook business page? Hi! I am having the same issue that Darin was having. I uploaded the video and published it over 30 minutes ago and it still doesn’t show the “Auto Generate” button. I have looked for a solution everywhere. Does it take a few hours before that option will show up? Is it a lengthy video? Are you currently using it in an ad? It eventually showed up after about an hour. Not sure if that’s normal or not. I ended up using Youtube’s built-in caption maker to create a file for facebook. I’m glad it showed up! Facebook doesn’t put a specific time on when the captions will be available. When adding a new video, though, there is a “processing” period. Sounds like things were just moving a bit slow on FB’s end. HI thank you for your article – I’ve managed to add captions to my FB video using this method that you have shown, and they show up fine on a desktop, but not on mobile – do you have any suggestions as to why this may be? Hi Heather! Are you watching your video with sound on on mobile? Facebook has starting moving to getting “smarter” and not showing captions if the video’s sound is on. Thanks! Can’t save captions: Sorry, something went wrong while uploading captions. Please try again. Is this because it’s already published? This happens to me from time to time as well. I will try waiting a few hours to see if it corrects. Facebook is very quirky like this, unfortunately. Itâ€™s not one I uploaded today, itâ€™s been on a week but I onky tried to do the subtitles today. Sorry, I wasn’t clear enough! I didn’t mean to wait a few hours after publishing the video, but rather that I try to come back later when I get that captions error. There’s really nothing to do but keep trying. I’ve even had it where I was working my way through editing the captions that were already applied to the video, and saving as I went. I could get it to save and update the first couple times, and then started getting that same caption error. It says “Sorry you don’t have permission to edit this video”…. I’m an administrator on the page. The post/video is being used in an Ad, would that change things? It was also originally a Live video, does that make a difference? Yes, it would. If the video wasn’t part of an active ad, you’d be able to add or edit captions. It doesn’t matter if it was first a Live video. Hi, The “save” button is grayed out whenever I’m trying to add caption to an existing FB video. Have you had this problem before? I’ve tried using both Chrome and Firefox but both are giving me the same issue. Facebook now requires you to have a title for your video. If you add a title, it should allow you to save. I’ve added my captions and I can see them on my desktop but I can’t see them on my phone and nor can my page followers. (And it’s not because mt caption settings aren’t on in my phone – I see other content with captions with no issue). Facebook is supposed to be able to detect if you have your volume on or not and uses that to determine if it shows the captions. I noticed that when I visited your Page and viewed your video, I was able to see your captions once I turned my sound off, and the captions went away with the sound on. Helpful but it seems in the last 6 months ? the Pause video while typing button has vanished… so now when I go to edit the captions the video keeps starting and putting me back to the start… it is BEYOND annoying and time-wasting!! I can easily skim the captions knowing what I’ve said etc, I don’t need the video most of the time. I’ve googled but had no luck finding people talking about this. Thoughts? thanks! I agree – majorly annoying! I have no idea why Facebook took away the pause. I’m hoping Facebook will put that back because it’s a basic and necessary function. Thank you for these tips and they are very helpful! After generating the caption, they are blocking my face a little bit. Does Facebook allow us to change the position of the caption? Unfortunately, no. That would be a great feature for Facebook to add, though. If you post your videos on YouTube, you’ll find additional caption options like even changing the font size and style.